Because of Nikon's strict price enforcing in the US, we hardly get any good deals on cameras and lenses. There is a new low price on refurbished Nikon D7000 cameras: $549 from rakuten.com (the former buy.com) with free shipping. This deal is valid till 12/12/2013. 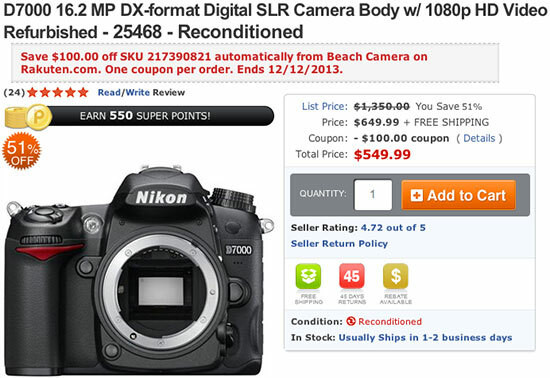 This entry was posted in Deals, Nikon D7000 and tagged Refurbished. Bookmark the permalink. Trackbacks are closed, but you can post a comment.